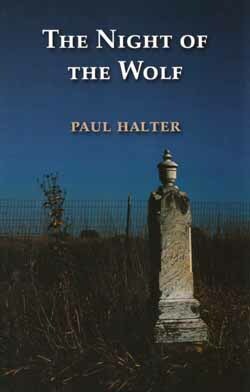 La Nuit du loup (The Night of the Wolf) is thus far the only short story collection written by Paul Halter, and it was also his first book to be translated and published into English (back in 2007). It’s a wonderful collection that brings together all sorts of stories: some set in modern day, some starring Dr. Alan Twist, and others featuring Owen Burns. Halter has written several other short stories that have been uncollected thus far, and there’s enough to warrant a second collection, which would be most welcome. 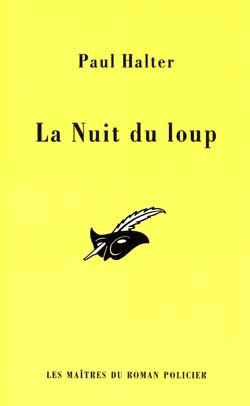 However, it’s important to emphasize that I have read and will be reviewing the original French edition of La Nuit du Loup. 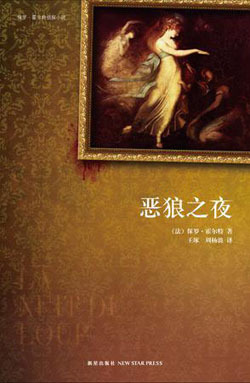 There are several differences between the English translation and the original book. For one thing, the French edition contains only nine short stories (although the back cover claims it’s eight), while the English translation features ten. One of the original short stories was dropped because it was impossible to translate into English, and two others were added to bring the total up to ten: L’Abominable bonhomme de neige (The Abominable Snowman) and Le Spectre doré (The Golden Ghost). Finally, the order of the short stories is fairly different, although both English and French editions end with the titular short story. This is a very short story to kick the collection off, taking place in modern day Le Havre. A ruthless business mogul, Bertrand Charpie, takes a ride on the world’s longest escalator. Police are guarding both ends of the tunnel, and some even accompany him on the escalator. About midway through the tunnel, a gunshot sounds and Charpie slumps to the ground, mortally wounded. But nobody has entered or left the tunnel, and witnesses swear they didn’t see the killer! Finally, what makes this all the more strange is that the escalator is apparently cursed, for Charpie is the third person to die in these apparently impossible circumstances! The story is extremely short, and there lies its greatest virtue and weakness. The short length is appreciated because while the impossible crime has a good solution, it probably wouldn’t have survived a much longer length. The story somewhat relies on the reader having little time to think things through before the solution is revealed. However, precisely due to the short length, some of the story’s elements seem extraneous—like those things that pass themselves off as characters. I struggled to remember anybody’s name or personality. This story makes Halter’s position quite clear: he is writing puzzles, not Great Literature. And although I entirely approve of this approach, in this story, it seems somewhat excessive—like you’re reading a summary of a story instead of the story itself. These reservations aside, I did enjoy the story very much and found the solution elegant and simple. Already the second story is a major improvement, as Dr. Alan Twist intervenes to solve the case. (By the way, Twist is devoid of his partner, Inspector Hurst, for most of the stories.) It’s all about an old family curse— after a seemingly random and inexplicable murder, laughter is heard coming from the sealed crypt where the victim has been buried. When the crypt is opened, some coffins are discovered scattered about the room, some coffins are empty, and others contain two corpses in all-too-suggestive positions! Halter also does a nice job of creating atmosphere with his plot— the events are of such a bizarre nature that atmosphere seems to create itself around them! This story was left out of the English translation because it is frankly impossible to translate. It relies on a misinterpretation of the French language that simply can’t be translated into English without building the story around something else. It’s not a particularly brilliant story, but it’s agreeable enough, featuring a good final twist that I only saw coming a few sentences prior to its arrival. The only potential objection is that the murderer could have gone about their business so much more easily— but that’s something that I honestly don’t care about. If you’d like a fuller plot summary to find out just what the ending is and why it’s so untranslateable, feel free to contact me. The solution to this classic lack-of-footprints-in-the-snow scenario is brilliantly simple, elegant, fairly-clued, and plausible. It’s one of the best stories in the collection. This is the absolute masterpiece of the collection, in which Paul Halter unashamedly tries to make his readers believe in Santa Claus! And truth be told… he comes awfully close. The story involves a rich miser named Drake Sterling, who fires Buckley, a long-time employee, out of “economic reasons” (a nicer way of saying he’s cheap). Buckley doesn’t take this very well and takes to the bottle, reducing his little 12-year old daughter, Sidonie, to selling flowers to try and scrape through. On Christmas Eve, Sterling is having a celebration with a few close people, including two young boys. He’s ruined the magic of Christmas and Santa Claus for the older boy, Theodore, but he condescendingly indulges young Tommy when the sound of bells is heard. Tommy rushes to the window and joyfully exclaims that Santa Claus has not forgotten little Sidonie— he arrived in his sleigh with reindeer, entered Sidonie’s house, and has flown off! The adults do not believe Tommy’s story at all, but when they go outside, they find mysterious prints that start out of nowhere and end just as abruptly— that of a sleigh being pulled by quadrupeds that might be horses… or could very well be reindeer! They enter Sidonie’s house, and a breathtaking sight awaits them, as a fire is lit, gifts are everywhere, and a few minutes later, Sidonie herself enters and sobs at Drake Sterling’s feet, believing he is the one behind everything. Sterling’s ice-cold heart doesn’t soften in the least, however; he is furious that Sidonie should have a proper Christmas and swears that he will find the truth one way or another! What makes this story particularly good is the involvement of Owen Burns. I think this is because Halter had a lot more say in the creation of Burns. When he wrote La Malédiction de Barberousse, which would become a Dr. Alan Twist novel, Halter originally wanted to resurrect the career of Dr. Gideon Fell. However, he was denied permission to use the character, and so he hastily rewrote the book replacing Fell with Twist. As a result, Dr. Twist is a lot more colourless than Owen Burns, who is modelled after Oscar Wilde and is a far more interesting detective, with a small touch of Sir Henry Merrivale about him. The story gains a lot with its magical atmosphere of the 19th century, and I just don’t think it would have been the same if it had been solved by Dr. Twist. Overall, this is the collection’s masterpiece. This is a short story which begins with a patient consulting a psychiatrist. A few twists later, we found out who the patient really is and why he’s really at the psychiatrist’s office. It’s a short story, without an impossible crime, and it’s a good enough tale. It involves one of Halter’s favourite recurring motifs, that of Jack the Ripper. It’s nothing brilliant, especially after the heights of the last story, but it’s definitely enjoyable. Owen Burns returns to solve a very strange business: namely explaining how a man can dream the correct details of a murder at the exact same moment as the murder takes place! It’s a good story of “murder in retrospect” in America, told to Burns by an American. The solution is a bit more guessable than the other impossible crimes in this book, but it’s still very clever and enjoyable! Again, Owen Burns’ presence elevates the story a lot. He’s Halter’s most interesting detective and the author seems to love writing stories with him! He adds a lot of colour to an average investigation and as a result, the story is a pretty good one as opposed to merely “okay”. A retired winemaker and part-time debunker of fraudulent occultists has gotten a death threat from one of the magicians he’s exposed. So he does what anyone else in a locked-room mystery would do: he goes to a top of a tower, locks two doors behind him, and comfortably awaits to be poisoned in impossible circumstances by reading a first edition of Harold Vickers’ ultra-rare novel, La Mort avait des ailes (Death Had Wings). (Vickers, of course, is the murder victim in Halter’s novel La Mort Vous Invite (Death Invites You), so it’s a nice self-referential moment.) Dr. Alan Twist solves the case with the aid of Inspector Archibald Hurst. The impossible poisoning is interesting, but the method is so very unreliable! The killer couldn’t possibly count on its working in just the way he hoped. (Not much of a spoiler there since all the characters are male.) If it works it’s a good, if farfetched, way of committing murder— if it fails, the victim either does not die or the method becomes quite plain. Overall it’s a decent story. One thing interests me about the story— I completely misread one word initially, and as a result, I actually solved the case long before Dr. Twist revealed the solution, since it formed a clue. I would have thought this would make the story impossible to translate, but as I’ve found out, translators John Pugmire and Robert Adey came up with an absolutely brilliant English variation on the clue that I quite accidentally stumbled across. This is a non-series story, and I can’t exactly determine the time period it takes place in. It could be happening anytime between the 1920s and modern day, since there’s nothing specific to pin it down—no mentions of the internet, cell phone plans, or that new-fangled technology of television. This is another murder in which the killer leaves no footprints in the snow, and the solution is solid. However, it’s the ending that is most interesting, as Halter manages to nicely fool his readers, most of whom will make an assumption about the story early on, only to have the tables turned neatly at the finale. The only problem? This final twist is clever, but the introduction to the twist is a little bit forced. I’m personally more than willing to ignore this minor problem in an otherwise solidly-constructed tale. Overall, what can be said about La Nuit du loup? Paul Halter works very well in short stories, using a pure puzzle-plot approach but coming up with excellent atmosphere at the same time. At the top of his game, he’s capable of creating masterpieces like The Flower Girl, and there’s no real dud among these stories— even the poorer tales are interesting and fun enough! All this makes me wonder if Halter will release another collection— there seems to be enough material, and it would be most welcome! La Nuit du loup (The Night of the Wolf) is a very good short story collection that aficionados of the impossible crime simply can’t afford to miss! It’s a good representative sample of Halter’s work, bringing together tales that take place in modern France as well as stories starring his regular detectives, Owen Burns and Dr. Alan Twist. I highly recommend it! Curious to find out about those two other stories? For reviews of The Golden Ghost and The Abominable Snowman, click here to read! I know that it is impossible for you to reply now, but when your studies are over (or maybe after New Year's) I'll have to write to you to ask what the story "An Appointment as Ridiculous" is about. Obviously, you don't want to spoil things for readers who don't know French, but I don't want to wait to learn French to see what this short story is about.